Felicity is a young girl whose mom wants her to grow up and be a gentlewoman, but Felicity's heart tells her otherwise.Nine-year-old Felicity (Shailene Woodley) knows she's supposed to stay quietly indoors doing "sitting-down kinds of things." But she yearns for the freedom of the outdoors...and especially for the adventure of riding horses. Then she meets a beautiful, copper-colored mare who's mistreated by her cruel owner. When Felicity tries to rescue the horse she calls Penny, she learns valuable lessons about loyalty, responsibility and independence. Really good movie! You need to watch it! Wow!I love it. it's wonderful! Felicity is a great story! I also enjoyed that movie because of the horse Penny. I liked her because she finally trusted Felicity. She also got to live with Felicity instead of Mr.Ni. I liked the movie pretty well and i loved shalene woodly in the faults in our stars (such a sad movie btw) but since she was younger i don't think she was that great of an actress back then, but it is definitely a cute story-line and cute for families my little sister loves it she has it on dvd. it is cute for the younger ones though, but tweens and teens might not like it as well. i liked it though and i'm almost 14. so watch it and see what you think! This movie is soooo good. I love Penny, and Felicity has my exact personality. I especially like when Penny's foal is born. Felicity is one awesome movie! I LOVE this movie! I'll have all the Felicity books. felicity is my fave doll. She is one of my 2 American dolls. This is one of the best movies ever, of course I say that about every movie that involves horses. I loved this movie so much one of the best i've seen! I don't like it that much now. I LOVED it when I was about 10 or so. I kinda grew out of it though. It's really corny and silly now. I LOVE Penny though! She is a beauty! It's good if you are in between the ages of 7-11.
this movie is one of my favorites. if you know the felicity from the american girl books you'll sure to love the movie! This is a great movie for all horse lovers and it is a really adventurous movie and this is an american girl movie. But you might like the Horses better!!!!!!!!!!!!!!!!!!! best movie ever!!!!!! you have to see it. I watched this and I love it! this is a great movie for all ages. it is like the books but all put together in one movie and story. you will love it if you watch it!!!!!!!!!!!!!!!!!! It is such a good movie!! she is my fav american girl!! i have seen the movie. it is sad and happy. i have my own horse, i am glad that my horse never got whipped. FELICITY IS MY NAME TOO AND I THINK FELICITY IS THE BEST MOVIE I HAVE EVER SEEN!!! I LOVE HORSES! THEY ARE SO COOL AND FUN TO RIDE! I HAVE READ ALL THE BOOKS THREE OR FOUR TIMES CUZ THEY ARE SO GREAT!!!! I LOVE FELICITY BECAUSE A GREAT MOVIE! YES IT IS! AND IT IS MY NAME TOO. I LOVE ALL THE OTHER BOOKS TOO, LIKE FELICITY SAVES THE DAY. I like the movie. I name my horse Penny. I love Felicity.It is a real good movie about friendship and horses. I LOVE FELICITY!!!!! It's really good. My favorite part is when she gets Penny as her very own. And when she and Jiggy Nigh finally trust each other. I recomend this movie to any true horse lover! hi im 8 im a bigest fane of horses and im a bigest fane of felicity. Felicity is the Best movie!!!!!!!!!!!!!!!!!!!!!!!!!!!!!!!!!!! 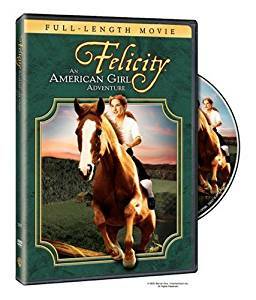 Felicity is the best movie it has it alll...Horses,manners,and history.......And plus it's Amercian Girl!! And it tells about a family's struggles in the 1700's though a girl's point of view! WATCH IT it's for the whole family!!! i love this movie! i have watched it about 20 times! This is such a good movie! I recommend it for everyone! Ok, I'm 13 and I got this movie when I was 12 and I would recommend it to everyone who love's history and horses. The book's are great and the movie even better. if you haven't seen this you have to. It's like a hysterical version of a horse loving tomboy.lol. I recommend it for all ages!! It's such a fabulous storyline!! You have to see it!! It is an American girl doll movie and it is really good. It is about a girl named Felicity and she meets this guy named jiggy-nye and he gets a horse and he is very mean to the horse. Felicity rides the horse every night and she named him Penny because of the coulor of his skin. Hope you like the movie too. I love that movie it is like the best movie in the world!